You're not currently sipping a weed beer for a few good reasons (one being that weed is illegal at the federal level), but the drink-your-pot movement can only be helped by better products. 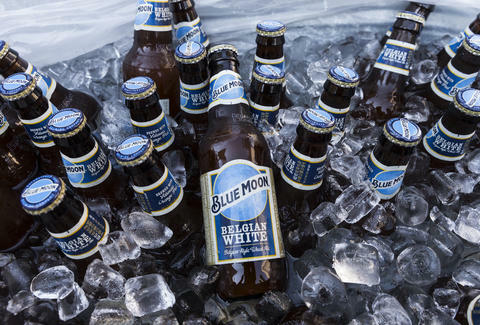 And good news on that front: The brewer who invented Blue Moon is working on three weed-based brews that'll give you the gift of feeling kinda funny with no risk of a hangover, which is frankly quite chill of him. The beers should hit shelves as soon as this fall, but only in Colorado for now. Next year other states with legal weed will get a taste, and after that we'll just have to hope the federal government changes its mind. In the meantime, Coloradoans can look forward to three selections: a light beer, a wheat beer, and a heavier beer, probably something like an Imperial or barrel-aged stout. "This is really about brewing great beers that beer drinkers love," said Keith Villa, the man who developed Blue Moon Belgian Wheat and is developing these beers. "You'd just swap out an alcoholic beer for one of our beers." All three will be alcohol-free, which is probably a wise omission. Instead, they'll be using marijuana compounds to mimic the effects of a crispy cold one. They even claim that the effects will take hold at a similar pace to getting a beer buzz. That'd be big news, as a major problem with edibles is that they often take an hour to kick in, which can lead to people eating too much and having a Bad Time. This is all part of a collaboration with Ebbu, a Colorado-based company that works in extracting and analyzing marijuana compounds. If it tastes good enough, demand for it might be too much for the White House to ignore.